Hey, cutie pie in the sky, did you check out that "Vernacular Pie" comic in the Indy Week's Pie Issue last month? If not, you don't have to eat humble pie, cause it's right here. Oh, are you too pie-eyed to realize it? Alright. Enough. Sorry. 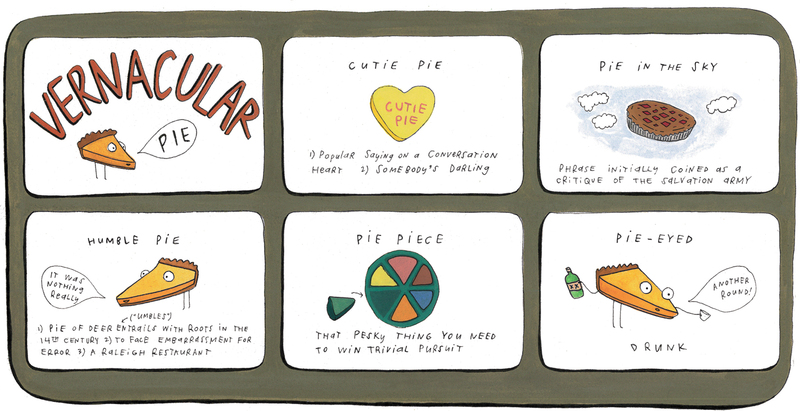 Anyway, my friend Emily Wallace strikes again, here with her clever illustration on pie's role in the parlance of our times. You can catch more of her pie-related comics here and here, and more of her art in general, on the topics of Dollywood, the foods of the North Carolina State Fair, Destiny's (ahem, Testiny's) Child, and much more, right over here.